It’s finally starting to feel like fall! Hopefully it won’t warm back up to 100° next week. I’m ready to be eating my favorite fall comfort foods. 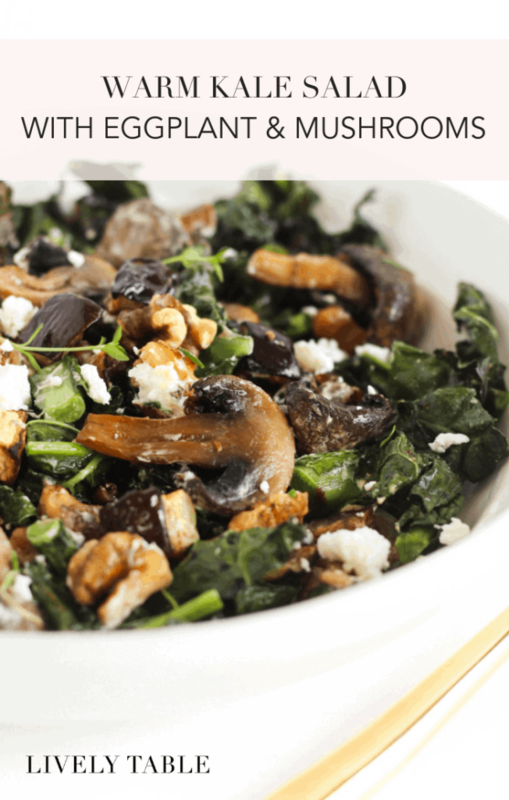 This roasted Warm Eggplant, Mushroom, and Kale Salad is the perfect fall salad. It is served hot straight from the oven with warm fall flavors like thyme and balsamic vinegar, with creamy goat cheese that make the mushrooms, kale and eggplant so comforting and perfect for cooler temperatures when you don’t want a cold salad. If you don’t want to mess with making the dressing, a drizzle of balsamic vinegar works just fine too! Or you could use your favorite balsamic vinaigrette. Whatever you’d like. I like to serve this salad with roasted bone-in chicken or pork loin, but experiment with what you like. You can also make it a vegetarian meal by throwing in some chickpeas or tofu, or topping with a poached egg. As always, share your pictures of my recipes with #livelytable and tag @livelytable so I can see them! Preheat oven to 425°F. Line 2 baking sheets with parchment or silicone baking mats. Cut eggplant into uniform 1 inch cubes. Toss with 1/2 tbsp of the olive oil and spread onto one of the cookie sheets. Wash mushrooms and cut each in half. Toss with 1/2 tbsp olive oil and add to cookie sheet with eggplant. Roughly chop kale into uniform pieces and toss with 1/2 tbsp of olive oil. Spread onto other cookie sheet. Roast kale 10 minutes or until crispy but not burned. Roast eggplant and mushrooms 20 minutes, stirring every 5 minutes or so. Let vegetables cool slightly before handling. Meanwhile, prepare the dressing: In a small saucepan, and garlic, balsamic, oil and honey. Heat on low until thickened, about 10 minutes. Remove garlic cloves and stir in cracked pepper to taste. Set aside. In a large bowl combine roasted vegetables, dressing, walnuts, goat cheese, and thyme. Gently stir and serve immediately. Thanks Julie! I love kale and luckily my hubby does too! This is absolutely delicious! My mother immediately made the salad because I raved about it and she enjoyed it as well. I am now in the process of making it again ? Hi Julie, I’m so glad to hear that y’all enjoyed this salad! Thanks for stopping by! It is confusing – it says to use a crushed clove of garlic for the dressing but then it says “remove garlic clove”…other than being poorly written – its a great recipe! Glad you enjoyed this recipe, Eva! The garlic is gently crushed so that it remains whole to infuse into the dressing while it cooks, then it is removed. Hope that clarifies the steps a little. Very good, love this recipe! Maybe weird but I added a sprinkle of cinnamon to the eggplant and mushrooms for a fall vibe and it worked out well for me! Hi Lindsay, thanks for stopping by. I think the cinnamon sounds like a lovely addition! Glad you enjoyed the recipe! This is a fave in my house! I’m always looking for winter/cold weather salads, and I’ve been making this one for a while and now. I thought it was time I let you know 🙂 It is the perfect combination of yummy stuff! Thank you!